I almost forgot about this one, but a piece of tumbleweed blowing through my otherwise vacant mind dislodged a memory that I had forgotten about. Around a week or so ago I got an email from Barrabas Zabaleta of virtual worlds builders, Mosi Mosi (who produced the entertainingly fun Prados Azules sim). The mail contained an offer of a pre-launch walkabout of a new sim. I had meant to take up the offer, got sidetracked and ended up forgetting about it... until today. Why today? Well today was when the sim actually opened, and this (or the tumbleweed) triggered my memory. I was a little surprised when I checked the map, though. The sim was empty. Had I got the dates muddled up? Had I missed it? Was I too early? The answers are (in order): 'No'; 'Dunno' and 'Dunno'. low-maintenance corporate outcrop of the VW group and a budget car builder from Spain - Spain being about as famous for car production as Italy is for golfing holidays." The car got a good review, by the way... but now let's move on to the sim. The first thing that struck me was just how much Mosi Mosi have been able to fit into the sim, yet without it feeling cramped. I honestly had to check the Map a couple of times, to reassure myself that it was just the one sim! There's a lot to see and do, as you might expect. One nice idea is a series of computer screens showing some "html-on-a-prim" webpages you should explore. By way of an example, in the attached photoset, I've included Torley's YouTube page. 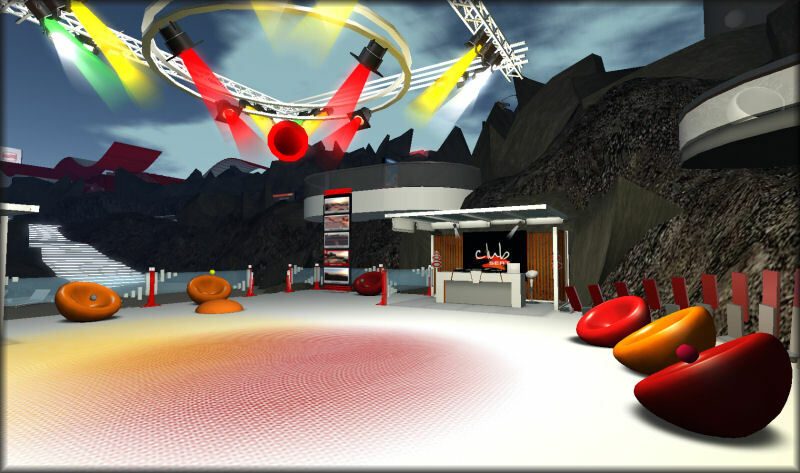 If you are new to SL, there's a number of orientation displays and there's also a HUD you can pick up, giving you information on cool sites to visit in SL. The cars are displayed in an elegant showroom, all sweeping curves and open space. Here you can pick up a range of freebies, ranging from drivers' helmets to scuba diving gear. While the latter seems bizarre - as if shoe-horned into the sim - there does seem to be some logic, since you are able to use your newly-gained equipment at the Beach Club. Here, you can also indulge in dancing and generally carousing. The biggest freebie is a car - but you have to win this by completing a series of challenges, at the end of which you receive your license and vehicle. Being totally rubbish at driving in SL, I did not give it a go. Finally there's a sandbox - which is nice to see. How this sim will fare with those who are professional marketing folk, I do not know. However, I liked the sim. It had handy hints for newcomers, lots of freebies, a sandbox (not that common these days) and some interesting, interactive challenges. It is also well constructed, coherent and adheres well to SEAT's branding. My only note of concern is about the promotion of the sim. I had expected some indications of a launch party, and perhaps a series of events to get the sim off to a good start. Promotion through SEAT's existing websites too - if it's there, I've not spotted it. So it appears to be something of a soft launch. If so, then all well and good. But for the company to extract more from the site, it will need a bigger, louder launch at some point - and a schedule of events and competitions might be an idea, too. To be honest, in promotional terms, I'm not sure how much good these actually do - but they're better than comatose sims.